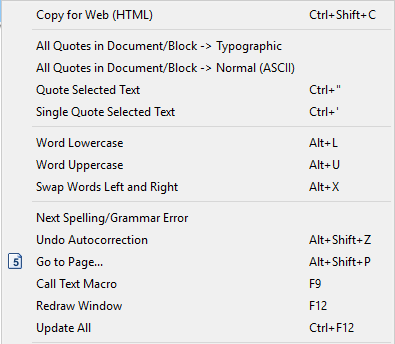 The “Edit” menu contains all options for text operations, find/replace, entering special text marks, etc. “Undo” will undo your last action (useful if you accidentally changed or deleted something important). Unlike “undo,” which goes a step back, “Redo” will go a step forward (basically undoes your last “undo”). With “undo” and “redo” you can easily go back or forward until your text appears the way you want it to. “Cut” will remove the segment of text you have marked and hold it for you in a block buffer, which is a type of clipboard. “Copy” will make a copy of the selected text and keep it in the block buffer, without removing it from the original. “Paste and Match Style” allows you to paste text sections, but leaves their old formatting behind and applies the formatting of the area you are pasting to. 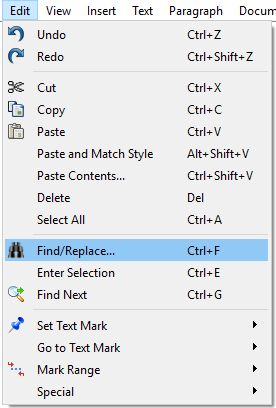 “Paste Contents” (also Ctrl-Shift-V) lets you choose the format you would like to paste with. This can be useful if you copy data that can either be displayed as a picture or text and you would like to choose a certain format when you paste. In the dialog, the formats will appear in order according to the content. 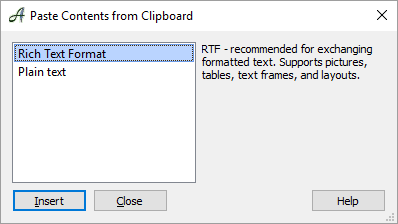 The format Papyrus would automatically choose to paste will be highlighted. “Delete” will remove a block of text without saving it to the clipboard for later use. In Papyrus, you also have the option to mummify your text instead of completely deleting it. You can also choose to use the “Revision Tracking,” which is easy to reverse and allows you to see what you have deleted. “Select All” will select the entire text if you are in text mode, and all graphic objects if you are in graphic mode. “Find/Replace…” will open the Find/Replace dialog, in which you can search for a word or a group of words in your text and replace them with text of your choice. By marking an area of your text and selecting “Enter Selection,” you can search for this specific selection without having to type it in manually, which also saves you the effort of opening the “Find/Replace” dialog. “Find Next” will find the next part of your text that matches your search. “Set Text Mark” and “Go to Text Mark” allow you to set up to six different spots in your text as a “Text Mark” and then jump between them. With a click on “Jump to previous change” you can see exactly where you were. This spot is also the one that will show up under the “Undo” drop-down menu, which means this menu also has to be selected to be displayed in the toolbar. This function ignores changes to graphic objects; it only searches for changes within your text. 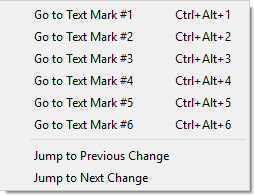 By choosing “Set Start Mark” and “Set End Mark” you can define an area, and with “Mark Range Active” you can tell Papyrus to restrict the marking of discontinuous text blocks to the area you have defined. There are a variety of special text operations in this sub-menu. “Copy for Web” copies the selected text in HTML to your clipboard. This allows you to paste the text into other HTML programs such as WordPress. If you have typed a word incorrectly, the “Edit” menu has an option that allows you to set either all the characters, or only the first character in uppercase or lowercase. To capitalize an entire word, select the whole word and choose the option “Word Uppercase;” to capitalize just the first letter, place your cursor within the word and choose the same option. “Swap Words Left and Right” allows you to quickly change the word order of your sentence (can also be used as a keyboard shortcut). “Next Spelling/Grammar Error” tells the spell check (once you have initiated it) to jump to the next mistake. “Go to Page” will open a dialog, in which you can quickly jump to a page, or a master page. You can also access your “Text Macros” dialog here (or by hitting F9). 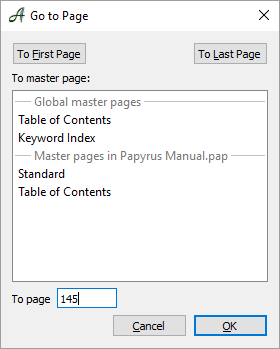 If you have the feeling that Papyrus is not displaying your page correctly, for example if parts of a picture or old text are visible and shouldn’t be anymore, you can choose the option “Redraw Window” (you can also hit F12). The window will be redrawn and your display problems will be solved. By selecting “Update All” you will tell Papyrus to update your entire document, as well as to start a new spell/grammar check.